As Zach was turning 3 (blog post to come on that sneaky weepy day) Alex and I commented to each other that it was not as hard to believe that Zach was three, as it was to believe that James was about to be 6 months old. Where has the time gone? 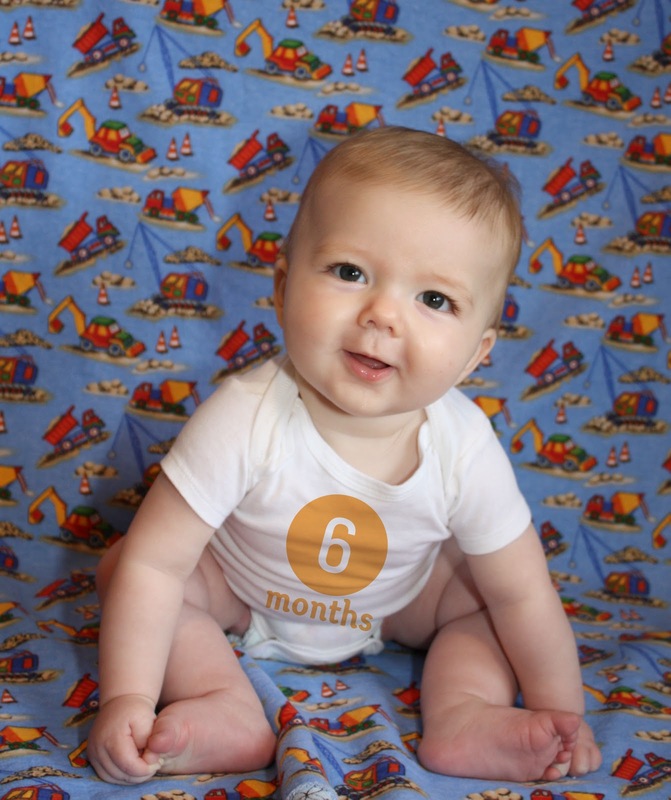 How is my roly poly baby halfway to a year old? This cannot possibly be correct, I must have done the math wrong. But I digress. As usual. This month, James started to sit up, a very wobbly stay-very-close-and-pretend-to-be-an-attentive-mother sitting position, but he is SUPER excited to be doing it. He also rolls front to back and vice versa and does that all over the carpet. Though he still forgets that he can roll off his tummy and routinely bangs his face into the carpet and starts to cry. He is still just a delight to everyone that comes in contact with him. Even, surprisingly enough, his brother. James has realized that Zach is there and fairly entertaining so he now beams at him when he catches sight of him. Granted, that smile usually turns to slight tension as he is being hugged and gripped by an enthusiastic 3 year old. My baby is huge and I want to cry. Next time you are headed to visit Alex's extended family in St. Louis you MUST let me know ahead of time. Because I MUST cuddle that most adorable baby before he gets too big and I will drive the 4 hour round trip just to do so!